Then again this is a country where the Caracas people are spared the electricity shortages which mean more severe shortages of light outside of Caracas than what they should be called for; but i digress. How was this possible and why? The case in point today, the excuse that the Nazional Guard Bohorquez used, and wrongly at that, is the regulations that exist now as to food transport across Venezuela. I am referring to SADA (National Supervision of Silos, Warehouses and Agricultural Depots) and its control arm, SICA (Integrated System of Agroalimentary Control). I am willing to bet anything that these were the brain child of Cuba "advisers" and Venezuelans who have never held any production job, who could not tell a corn field from a mango grove if their lives depended on it (1). 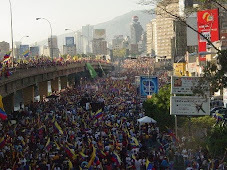 The objective is a paranoid one: make sure that the government knows at all time where is all the food in Venezuela. Paranoid because since the strike of 2003 chavismo lives in terror of running out of food, as if controlling its distribution would make failure in production disappear. Now, the beauty in the system for the government is that at any time you can get subjected to a search and if your physical inventory does not match the survey of the Nazional Guard (or any other fascist agency such as INDEPABIS) obtained from SICA you get a fine and risk to have a confiscation of the exceeding amount. Of course, in theory you can appeal and you have the right to show your paper trail to justify any problem; but we saw how little good it did to Polar yesterday as Bohorquez did not want to hear anything, "presumed" hoarding and took the loot with him, the whole loot, not the difference. In Venezuela there is no way that even a well organized concern such as Polar can make it. Let me list below a few of the problems that can arise, upon which Polar has no control and that are enough to screw your inventory balance and put you at risk of a creep like Bohorquez who wants to become a favorite of Chavez. The first one is the very web page of SICA which does not always work, which does no always report on time, etc... If you know how CADIVI works on the web when you want to get your traveling money you know how bad the governmental web system works. Thus, right from the start, you cannot know whether SICA got the information and whether that one was duly transmitted to some Nazional guard somewhere. The second is the difficulty of transport through Venezuela due to the heavy traffic, highway robbery, the very bad state of the roads and the difficultly to find spare parts fast if your truck were to break down on the road. Thus even if you report that you dispatched a truckload of food, if that truckload is missing in action for a couple days then the Nazional Guard inspecting the recipient facility can "presume" you are hoarding it somewhere. The third problem is that someone like Polar delivers to big and small markets and that this accounting cannot be exact all the time. Sure, after a few days all fall into place and all can be accounted but it is simply impossible for Polar to account at all time of every kilo of Harina P.A.N. becasue such a simple thing as a misplaced invoice by a secretary might not be accounted for a few hours. Also, when Polar makes it deliveries, the heavy traffic of most Venezuela large cities does not guarantee that the truck will have time to stop everywhere. If that truck comes back to the warehouse late at night when the office is closed, it is bringing back "excess" inventory and thus "presumably" hoarding. And more ways of course, much more if we can even imagine SICA/Nazional Guard complicity in retaining trucks on the road at one of the innumerable "alcabalas" until there is an obvious gap at the recipient warehouse. True, the regulations of SICA also include certain dispositions which you can use to account for any "irregularity" but if you are a company under the Chavez radar like Polar or Cargill during an electoral campaign, those delays will not be honored and your merchandise will simply be stolen from you to please the huddled chavista masses. The more so if your state governor, Falcon in this case, is in an open confrontation with Chavez. People outside of Venezuela have no idea how difficult it has become for the private sector to work, though statistics groups are now consistently ranking Venezuela in the lowest echelons of productivity, competitiveness and other commercial indicators associated with poor and dysfunctional countries. It is beyond the scope of this article to list all the tribulations that we are confronted on a daily basis, it will suffice to say that the Chavez administration has built over the years a pseudo legal system engineered with the main objective of screwing up any private business as needed. All these regulations from workers right to currency controls, going through SADA and SICA are so difficult to fulfill that it is simply impossible to make it unless you are a reasonably large company that can afford to pay people strictly to track down all the regulations and deal with them. And yet we see that it is not enough to protect Polar or Cargill when political expediency requires an attack on them. To gather from yourself the bureaucratic ill intention of the regime look at the list of all the items that must be declared at SADA. There are 273 food items. 273! I mean, there might be a case to be made if the government wanted to make sure that the very basic staples were guaranteed for the masses. But how can you explain that the list of items to report if you want to ship them include (57) refined coconut oil, (64) capers, (68) bird seed, as in for canary and parrots, (72) chocolate, (96) goat meat, (127) salmon steaks, (155) ice cream, (181) apples, (198) pears, (217) organic chemical products (what the f...? ), (226) smoked salmon, (227) frozen salmon, just to name some of the most offensive ones when you discuss the survival diet of a tropical country. And yet from that list you will be missing mangoes, watermelons, banana, etc.... inexcusable when apples and pears are included. More than anything the list shows you the intent to harass medium to large business because the items excluded from the list are those managed by your local producer and "frutero". Of course these people if caught would not be able to pay the fine, or the bribe as the case might be. And now to the why. It is very simple: Chavez has built his political career on the promise of giving and giving. Now he is running out of money because he has created an unmanageable large class of state recipients at the same time as oil production and revenue go down. He needs to distribute something to maintain his image and thus the time has come to steal from the rich to give to the poor, the ultimate state of populism until it must become a repressive regime to remain in power. When you are in the business like I am, you know that 120 tons of Harina P.A.N. in Barquisimeto is really not that much and it is certainly not worth hoarding: in D and E sectors, the daily consumption is almost a kilo a day for a family of 4. Even if you were taking an average of 50 grams a day per inhabitant Barquisimeto alone would consume everyday around 25 tons of corn flour, that is, the 120 tons seized would be eaten by Barquisimeto alone in a week!!!!!!!! Never mind when we add the area deserved by Barquisimeto warehouses... Hoarding? My foot! Why doesn't Polar and Cargill just shut down? Let the Chavistas celebrate victory. That will only last until the people see what it is they have "won". Good post. You are a hero for trying still to work in the private sector. Chavez is really Zimbabwizing the country as fast as possible. But we saw it coming and the worse it gets with the economy, the more Chavez will use these methods, distribute then the stuff to his supporters in general and later on more and more to professional thugs. I really don't think this has anything to do with databases and regulations. I think it is simple persecution of Polar and Cargill in an oppo state plus a mix of election year populism when you don't have any money. I think there is an element of preparation for severe shortages that occur as a result of currency controls too. All of this can work for Chavez very well until there is no food left to steal. And apples and pears? Don't you know only oligarchs eat apples and pears and salmon? Dolar paralelo is back on the net I guess Chavez cant stop it. Considering most of the food is imported the government know when it comes in country. Why they would do this?Thinking beyond local stupidity, I would suspect that the governments importing efforts are not going well. You just don't go to Miami and buy a freighter full of corn or wheat. Also, to get good pricing you have to buy futures and options. Companies like Polar and Cargill are buying years into the future. I don't know what makes me sadder: this unmitigated robbery or that it appears that in Venezuela this robbery has been met with a silence that implies acquiescence- our intrepid blogger excepted. I wonder if this will lead to a takeover of Polar and/or Cargill. If it occurs, Thugo will have the takeover as close to election day as possible, to avoid unpleasant comparisons to pre-Thugo and post-Thugo operations of the company. Were Thugo to take one or both of them over in June, the ensuing collapse of their operations when managed by Chavista fools would have enough time to penetrate the awareness of many voters. At a rather gut level. Play on words intended. Instead of "if you don't work, you don't eat," we may be seeing "if you don't eat you don't vote." Los Venezolanos tienen una solucion para resolver este problema sin violencia. Es aparente que Chavez tiene una crisis economica. Que pasaria si el pueblo y las empresas y comercios dejan de pagar el agua, la electricidad, dejan de comprar articulos que pagan IVA. no pagan sus impuestos, y disminuyen la entrada de Bolivares al gobierno de Chavez. Al mismo tiempo se pasan todo el tiempo libre paseando y gastando gasolina. Agree with Kepler. You're to be commended for trying to still function in the private sector. I for one wouldn't blame you if you had to throw in the towel. This is a great description of what happens when the private free market is robbed. I'm always dumbfounded when my friends in Caracas tell me there is no harina pan, but I can buy it at a Latino store a few minutes away in suburban Georgia, USA, for a few bucks. Keep up the good fight. Hopefully someday this will be a bad dream you can wake up from. Daniel, do you see a solution? Some talk of strikes like Chile in the Allende days. Others want to hope that the Chavistas will someday change their minds. Some are ok with violence, others not. How will this end? No one's prediction has the weight that yours does. Any predictions on how this will all end? Or suggestions / scenarios that you'd support? I guess its partly due to their cult. For example in "modern" "left" propaganda they make hoarding by escualidos responsible for the economic, poltical and moral caos that existed at the end of the Allende Government in Chile. As the escualidos are a permanent recurrence of the oligarchia santanderiana, they think they need to protect the will of "el pueblo" against the eternal tools of the escualidos (like hoarding), pues. In the real worlds medium term, it will turn out as just another measure of this clueless Government with catastrophic consequences. Your harina pan comes from colombia, i am willing to bet.